Two days after the end of the legislative session, Gov. 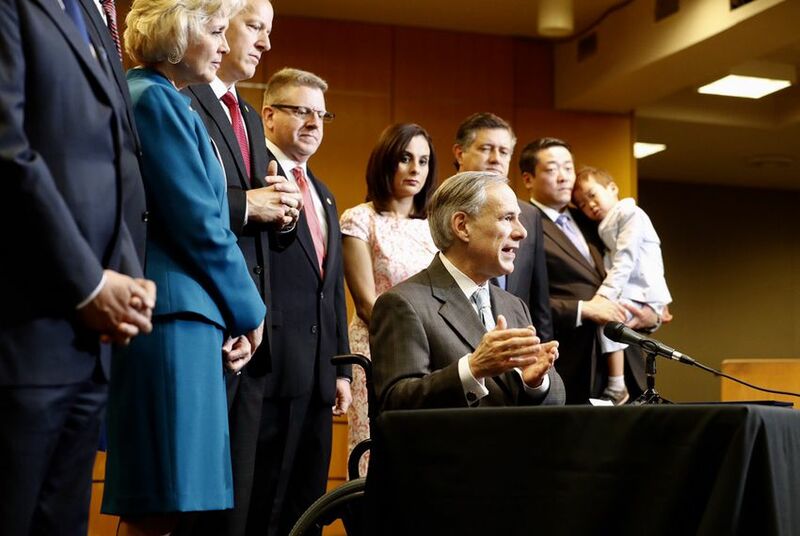 Greg Abbott held a public ceremony to sign four major child welfare bills into law. Gov. Greg Abbott signed four child welfare bills into law on Wednesday, measures that aim to recalibrate how the Texas Department of Family and Protective Services works with endangered children across the state. The bill signing comes just two days after the end of a legislative session that began in January amid headlines describing a state child welfare system stretched thin, with children sleeping in state offices and, in some cases, dying on the state's watch. Since October, Abbott, Lt. Gov. Dan Patrick and House Speaker Joe Straus have pressured both the department and legislators to make long-awaited changes to how the state helps children recover from abuse and find better living situations. Abbott said during the 20-minute ceremony that legislators came in knowing the state needed "a true reform from top to bottom" and made that happen. "With this landmark legislation, with the direction and pathway we're now on, I expect the Texas Child Protective Services and the Texas Department of Family and Protective Services to strive for, achieve and to accomplish No. 1 ranking status in the United States of America as it concerns taking care of our children," he said during the signing ceremony at the Department of Family and Protective Services headquarters. Abbott named the state's child welfare crisis as one of four emergency items during his State of the State address in January and warned legislators that the issue would "haunt" them if did not make the most of their 20 weeks at the Capitol. All four bills Abbott signed touch on various areas of the child welfare system, but HB 5 and SB 11 in particular make substantial changes to how the department operates. Under HB 5, the department would get full authority on issues like adoption placements, child abuse or neglect investigations, parental education programs, medical services for child abuse victims and protective services for people living with disabilities and the elderly. However, department officials would still share responsibility with the Health and Human Services Commission on creating medical service plans for children in the system and what information should go into a child's medical records, also known as a child's "health passport." The bill also re-establishes the Family and Protective Services Council to help make rules and policies for the department. Proponents have said the bill will allow the department to make decisions on their own faster and may help deter future crises. SB 11 was less well-received by child welfare advocates. The legislation calls for the department to find eight areas in Texas to implement a new community-based care program by the end of 2019. Advocates have said they're most worried about contracted organizations in the program taking over case management duties from the state, including overseeing caseworker visits, creating permanency plans for children and making sure children and their families are receiving services. Advocates say they fear those community-based care groups will not have the prowess or capacity to take on this kind of work, particularly when it comes to finding homes for children with behavioral and mental health issues. In addition, advocates have expressed concern that the transition started by SB 11 will lead to child welfare workers losing their jobs. Sen. Charles Schwertner, R-Georgetown, the author of SB 11 and chairman of the Senate Health and Human Services Committee, said after the bill signing that he was "very, very happy" about what the Legislature accomplished on child welfare. He said implementing the community-based care program is going to be "a lot to do" but that the department has the money and personnel to get it done. "I think that they're going to go full steam ahead," Schwertner said. "I hope they take the energy that we're feeling in this room and put it in place across Texas as they go about their daily business." After the bill signing, DFPS Commissioner Hank Whitman said the biggest challenge facing the department in implementing the community-based care program would be finding more providers. The state works with good providers already, "but now we're going to make them accountable to make sure that our children come out of the system quicker and get into permanency," he said. HB 7 focuses more on how the department and the courts work together with families facing abuse allegations. The legislation directs the department to only remove children from their homes over allegations of violence or abuse, not for reasons such as a parent having a low income or being charged with a nonviolent misdemeanor. The legislation also gives parents more access to the child welfare agency's evidence about allegations against them; prevents courts from terminating parent-child relationships without evidence; and stops courts from ordering medical or mental health treatment for a child before consulting a health care professional. Under HB 4, kinship care families would receive monthly payments to help them with ongoing costs of caring for young relatives who have been abused. Families who have had child relatives placed with them by the state have often expressed a willingness to help but lacked the financial resources to do so. Advocates said state-funded $350 monthly payment is a good starting point but stressed it was not nearly enough to cover a child's needs, such as clothing and food. While legislators expressed a doggedness throughout the session to overhaul the state's child welfare system, those efforts were often overshadowed by an ongoing federal court case. U.S. District Judge Janis Jack ruled in late 2015 that the state's foster care system violated children's rights. After the ruling, Jack forced Texas to pay for special masters to scrutinize the beleaguered Department of Family and Protective Services. Throughout a 13-page report released in November, the special masters highlighted a slew of areas the department should fix, including limiting caseworkers to between 14 and 17 cases, updating children's health records, better managing older children aging out of the system and implementing a 24-hour hotline for children in foster homes and residential centers. But state leaders and legislators have bemoaned the federal court's involvement since the ruling. Texas Attorney General Ken Paxton has previously called the court proceedings a "misguided federal takeover of the Texas foster care system.” Texas lawmakers have been adamant that the state can make fixes to the child welfare system without the court's help. But child welfare advocates say that the ruling and repeated cycles of bad news about the department and how children were faring under the state's watch emboldened legislators to take action this session. Abbott said Jack should "look at what Texas has accomplished" with the legislation and improvements the department has made in recent months. He noted that with the $150 million in emergency funding given to the department last year, the agency has been able to offer better salaries and hire more caseworkers. The agency has seen a 35 percent decrease in turnover rates among CPS workers since fiscal year 2016, according to a fact sheet released at the event. Caseloads per worker have also decreased from an average of 18.2 to 13.3 in the past year. "I think the judge should be pleased that Texas did our constitutional and legal duty on our own to implement landmark legislation that completely transforms the system in ways that will make it better and that the case should be dismissed," Abbott said. The governor also fielded a question about Colton Turner, the 2-year-old boy who was found dead in 2014 after his mother, Meagan Work, and her boyfriend, Michael Turner, killed him and dumped his body in a Southeast Austin field. Michael Turner pleaded guilty and is currently serving a 20-year prison sentence, and Work's trial date is slated for Oct. 30. The department had conducted four investigations into the case — and found that Colton had endured physical and sexual abuse — but an October 2014 review found "there were failures to follow policy as well as mistakes in judgment by caseworkers and/or supervisory personnel." Investigators also found drugs in the home. Abbott said Colton's death was a tragedy, and tragedies are a part of life. But he said the bills he signed would "dramatically improve the lives of our children and ... reduce the probability and the possibility of the child being harmed. "What I would tell the families who have lost their children is that there's no imaginable way that anyone can understand the magnitude of their grief," Abbott said. "I would do anything that I possibly could to bring their child back, but their family now has a lasting legacy knowing that they are a part of transforming Texas history." Texas legislators cast final votes Sunday evening on a pair of bills overhauling how the Texas Department of Family and Protective Services works with and finds homes for abused and neglected children. House lawmakers voted to streamline how courts work with the state's child welfare agency to protect abused and neglected kids — and laid out concrete reasons children can be removed from their homes. After months of calls from advocates to take drastic measures, both chambers unanimously passed bills on that would change how the Texas Department of Family and Protective Services cares for vulnerable children. Texas children facing abuse and neglect is set to be a major issue during this year's session as legislators grapple with less funding, a federal court case and troubling headlines about failings at the Department of Family and Protective Services. Senate Health and Human Services Committee members voted unanimously to send a bill aimed at overhauling the state's child welfare system to the full Senate for a vote.